28 MAR, 2019. 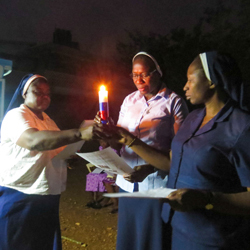 God has blessed the Institute of the Sisters of St Louis with a new community in the city of Savè, Republic of Benin. Opened and blessed on February 19, 2019, the long-awaited community is part of the Nigeria Province, with Constance Dibie SSL and Theresa Peter Sheyin SSL having been missioned there from Nigeria. 28 MAR, 2019. 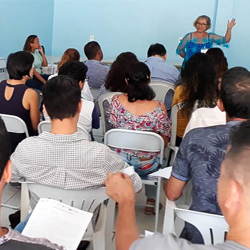 Elenice Natal de Lima SSL, Margaret Hosty SSL and SSL Associate, Suely Marinho, took part in a special HIV/AIDS conference at AAVE headquarters in the city of Goiânia, Brazil last month. The main objective of the conference was to formulate proposals which would contribute to the improvement of the National Health System. 6 MAR, 2019. 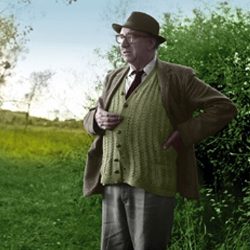 The revised and expanded 20th anniversary edition of Sr Úna Agnew’s book The Mystical Imagination of Patrick Kavanagh, A Buttonhole in Heaven, was published on February 28, 2019. 28 FEB, 2019. 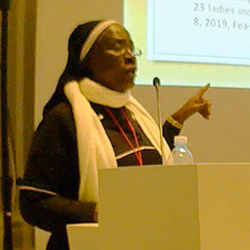 Patricia Ebegbulem SSL from our Nigeria region presented two papers at a recent International Conference on Human Trafficking in Palermo, Italy. 28 FEB, 2019. 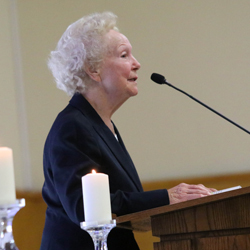 Maria Goretti Crowley SSL was a guest speaker at the 2019 Louisville High School, Woodland Hills, California, Heritage Liturgy, which is celebrated every year during Catholic Schools’ week. 31 JAN, 2019. The Irish Region and Institute Archives have moved home, from Monaghan to Blakestown in Dublin. After months of preparation, the big move took place on January 10, 2019, under the watchful eye of Ann Bolton SSL (Institute Archivist) and Anne Kavanagh SSL (Irish Region Archivist). Four hundred boxes were carefully packed before Christmas, and moved, along with steel shelving, cabinets, cupboards, desks, pictures, computers and a range of equipment, to a newly-renovated ground floor space in Blakestown.